Daredevil is back to succeed where Matt Murdock failed. The switch doesn’t keep Foggy or Karen at bay though. Not even Ray’s death could keep the truth under wraps, setting the stage for a titanic three way showdown between Daredevil, Dex-devil and the Kingpin. The battle, and the season, came to a close in brutal fashion. Foggy tracks down Mahoney as he is arresting Felix Manning following his interrogation y Daredevil. 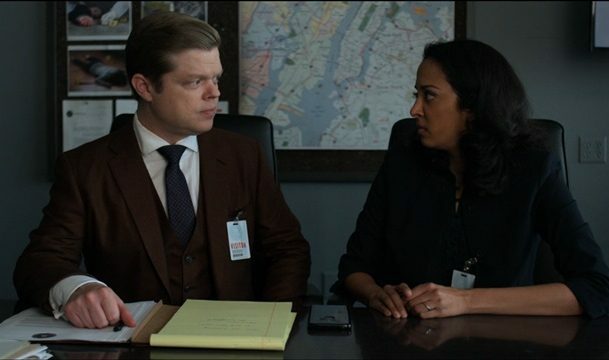 Foggy asks Mahoney to beef up security at the Presidential hotel because someone is going to try to kill Fisk. Mahoney shows little care for protecting Fisk, but says he’ll add his “C team” to the hotel’s detail. Karen doesn’t agree with Foggy’s request, but his concern over losing Matt again sways Karen to his side. Foggy is called away from Karen to the FBI. After tense, selfie-filled moment with Dex, Foggy is directed to a boardroom to meet with Seema. The agency has publicly framed Ray for agent Wynn’s murder and Seema seems to believe the story. The truth comes out when the two are left alone. Seema tells Foggy about Ray’s video and gives him her phone. The video is a dying declaration from Ray containing his entire testimony. Foggy recognizes that its classification as a dying declaration makes it admissible in court and Karen takes the video to the New York Bulletin offices. Matt provokes Dex with information regarding Julie’s fate gleaned from his chat with Felix. Matt gives Dex an address at which Dex finds both the bodies of Fisk’s hitmen and Julie stored in a meat freezer. The sight sends Dex over the edge with Fisk dead in his sights. 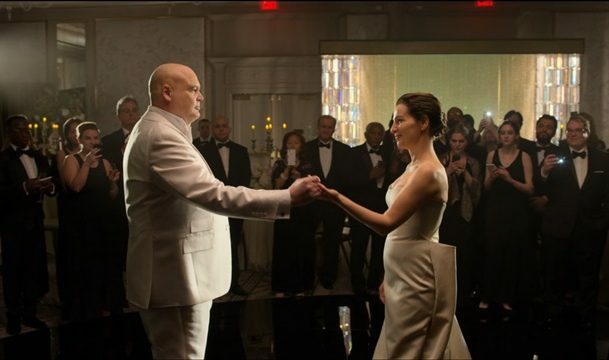 Fisk and Vanessa’s wedding occurs simultaneously. The two white-clad figures celebrate their union with many city officials and criminal figures at the Presidential. The two begin their first dance as their guests record them on their phones. Halfway through, Ray’s video begins playing on every phone in the room, causing the mood to grow tense. Dex arrives at the hotel dressed in the Daredevil costume. Julie is along for the ride as her frozen body is in the passenger’s seat. The sight frightens his fellow FBI agents. He fights his way to the wedding reception and appears on stage with the band. His attempt to murder Vanessa is thwarted by Daredevil. After taking down more FBI agents, the main event finally arrives. Fisk, Dex and Matt meet in a triple threat throw down in FIsk’s penthouse. Walls fall. Windows shatter. Blood is spilled. Dex tries multiple times to kill Vanessa, with each attempt being interrupted by Daredevil. Fisk tries to rush Vanessa out of the room while Dex and Matt fight on the balcony, but she only gets as far as the staircase. Fisk takes multiple glass shards to the abdomen, but brick walls Dex’s spine, paralyzing him. With the ranks whittled down to two, Matt gets the upper hand on FIsk. He gets Fisk on his knees and beats him to bloody mess, blood spattering onto the painting behind him. Vanessa screams for Matt to stop as Matt prepares to snap Fisk’s neck. Matt can’t bring himself to kill Fisk, angrily screaming before removing his mask. He proclaims victory over Fisk, saying he can’t destroy who he is. Fisk’s asks him to kill him, but Matt tells him that he will keep his identity secret and return to jail. Fisk balks at the idea until Matt uses his knowledge that Vanessa ordered Ray’s killing to get Fisk to shake on the deal. Fisk looks to his wife, telling her that today was the happiest day of his life. With Fisk in custody and Dex incapacitated, Matt returns to Clinton church for Father Lantom’s funeral. He meets with Maggie before the ceremony in the basement. The two come to terms on their shared past, with Matt understanding that his life made him who he is today. He delivers a eulogy for Lantom in which he speaks of the priest as a man without fear when it came to doing good. He points to the man as an example to live by before laying him to rest. 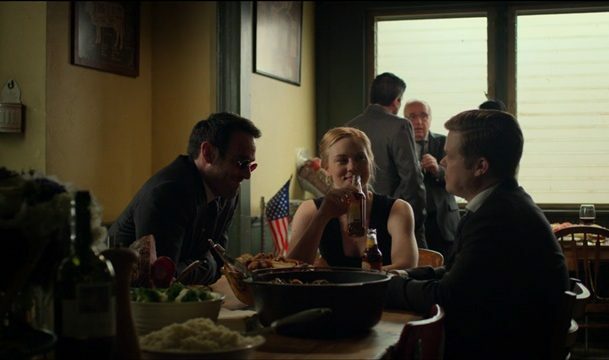 Matt, Karen and Foggy meet up at the Nelson’s butcher shop afterward. The shop is no longer in financial danger thanks to some swift negotiating by Foggy and news of Hattley turning state’s witness seals the case against Fisk. The trio finally have a chance to relax and reflect. Matt reclaims his public persona just in time for Foggy’s latest bright idea to be presented: a new firm with one key addition. Foggy reveals the words “Nelson, Murdock & Page” written on a napkin. Elsewhere, two surgeons are shown operating on someone’s spine. It seems they are stabilizing it with metal framing. 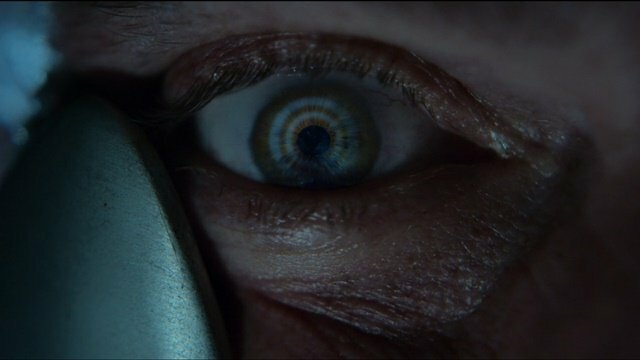 The patient is revealed to be Dex, though his eyes point to his rebirth as the villain Fisk truly set out to create, Bullseye. 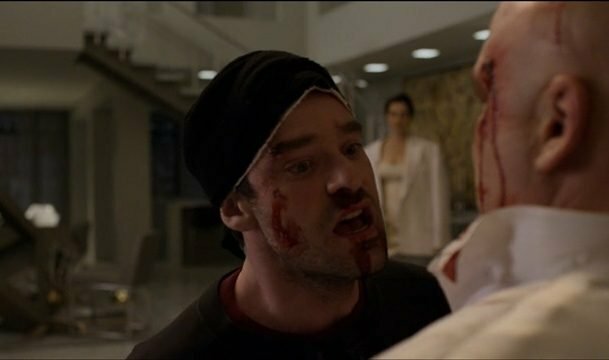 What do you think about Daredevil season 3 episode 13? Let us know in the comment section below!